The Gluten Free Maven: Real Cool! I always say when asked that classic question about what food you would bring to a desert island, my answer is pizza and ice cream. Not terribly practical if you are stranded on a desert island, but still the two foods I would choose to eat exclusively if I could. But, as we all know too much of a good thing is actually a bad thing.However, a company named Arctic Zero has created a product that makes it possible to have almost as much ice cream as you like. They make pints which have 150 calories, not per serving, but per pint. And realistically we all know everyone digs into the whole pint when no one is looking. They have a number of unique flavors like pumpkin spice and vanilla maple (just imagine that on warm apple pie), in addition to old favorites like chocolate and strawberry. They also make pops which are just the right size for the kiddies (and mommies too). And the best part is it is made with all natural ingredients. 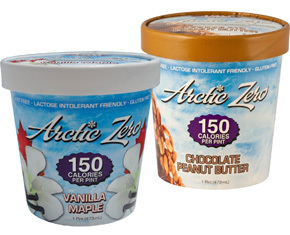 Arctic Zero doesn't have the artificial sweetener aftertaste of many low-cal frozen desserts. Instead they use something called monk fruit concentrate to boost the sweetness from organic cane sugar in the ingredients. Arctic Zero also include whey protein, so it has a nice boost of protein most frozen desserts do not. Although not dairy free, Arctic Zero is lactose free, so no upset tummies for those that are sensitive. I am kind of on pumpkin overload this time of year, and love all things pumpkin. Try making a shake with Arctic Zero pumpkinspice flavor (or any flavor you like) and coconut milk or whatever your milk of choice. Blend everything on high speed in the blender until smooth. Serve immediately. Note: For even more protein you can add a scoop of your favorite protein powder to the shake.